My first impression of this month's SoukSouk beauty box is great yet again! There's a selection of products from some lovely smaller companies and also a trial size product from Green People, one of the more well-known natural brands. 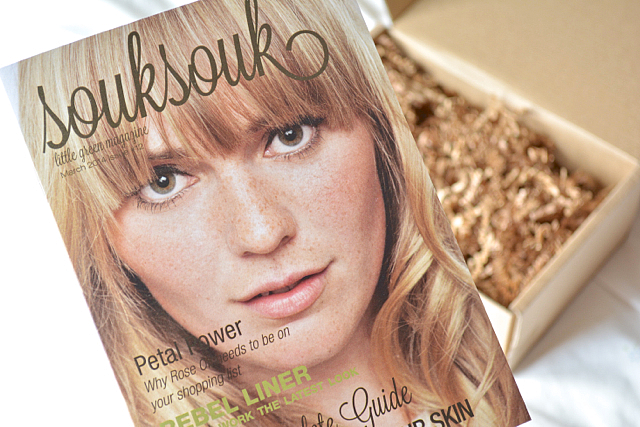 As always, the box comes complete with SoukSouk's Little Green Magazine. I've been wanting to try something from Bloom Remedies for ages so I'm really glad to see them included. I tested the cream on the back of my hand and it left my skin incredibly soft! Bohemian Chic Minerals is a brand I've not heard of before. The eyeshadow shade is called Kiwi, a medium-dark green shade with a subtle gold shimmer - not one I would have picked out myself as I tend to stick to neutrals, but I'll have a little experiment with it! (It says it's natural and vegan, I can't actually find a full ingredient listing anywhere though... pet peeve alert)! I'm looking forward to trying the Green People exfoliator, and the soap from Chain Bridge Honey Farm will be going straight in the soap dish in the bathroom! The value this month is great at about £25.00 - the box costs £12.00 plus £2.95 P&P, available here. I wish there was something like this in Canada!!! The products look gorgeous I love the homemade looking packagings. I'm interested in trying a natural beauty box so I may have to subscribe to this! Ahhh what a lovely box! This is the first one that really amazed me and makes me wish I was part of that subscription service. Bloom remedies seems like a great company, I have two of their trial moisturisers and theyre both great! I haven't tried ANY of these products! But they look wonderful. I really like this beauty box, great price, and great products! Hi..sorry about not having the ingredient list on the sample pot of eye shadow. The list is as follow.